Check out the size of my SD card! There was a time, not so long ago, that we thought 8GB SD cards were enough. Now a 32GB, 64GB or 128GB card could be considered normal and, despite the rise of cloud storage, many are still using their storage cards. 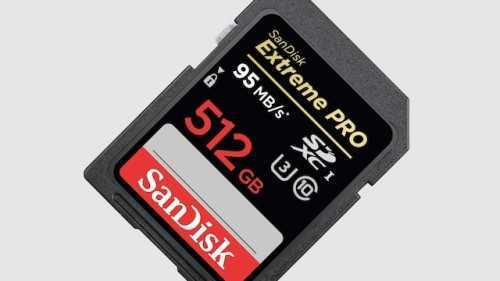 Now SanDisk have produced this 512GB storage card, which will initially be pretty expensive at around £490 to buy. That cost will come down of course, in time, and we could start seeing microSD versions too. It’s good enough for 4K video and is aimed currently at photographers and film makers at the moment, but with 4K video available on new smartphones there’ll be a future need for us too.